A family that has been missing for 48 hours is presumed to still be waiting in the massive line of cars to get into the James Island County Park Festival of Lights. Jerry and Anna Harper departed with their two children in their minivan two days ago to see the enormous holiday light display and haven’t been heard from since. Emergency officials are preparing tactical teams specially trained to manage impending bathroom emergencies. The James Island County Park Festival of Lights is extremely popular with Charleston-area residents because it provides an opportunity to see a massive holiday light display. Without it, everyone would have to drive to the trashy over-the-top house with millions of lights synced to fast-paced heavy metal Christmas music. 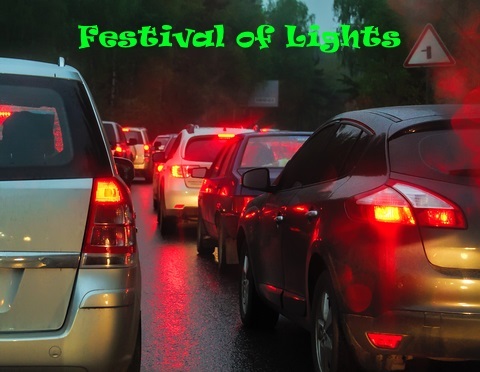 The Festival of Lights winds viewers through a single lane road in which cars drive at no more than 0.3 MPH while ooh and ahhing over Charleston landmarks replicated in Christmas lights. The poor traffic flow and slow moving cars cause most fathers to blow a gasket and ruin the holiday spirit. Husband Jerry Harper is expected to have a mental breakdown when he discovers the line to see Santa Claus has an estimated 23 day wait. Families have already set up tents along Riverland Drive to camp out in the line for the 2017 Festival of Lights.